When I had this stamp out a few weeks ago to use, I was rummaging through my paper. I came across this unusual wavy cardstock..... I might as well confess, I am a paper hoarder! Its not that I have too much, but I think long and hard about my patterned paper. To cut and not have it come out the way I imagine it should, feels like a waste - so I like to be sure I have a plan. I knew then and there I would make a card with this Lighthouse and fun paper. The blue paper from The Mango Frost DCWV stack called out to be the background. Using my Copics to color it, then choosing a Scripture Sentiment from the same Our Daily Bread Designs set Light of the World, I put this together. I think it makes a good masculine card - with a bold and positive scripture. While running around last week I managed to sneak into my new favorite stamp shop nearby. They had the new Flourishes set He Is Risen. Easter will be here before I know it so I grabbed the set and found some time this weekend to work in my stamp room (LOL, like I need an excuse). It was my hope to CASE Christine Okken at ChristineCreations....but the more I worked at trying the more obvious it became that this card had a mind of its own. Instead of the lovely card she made with a cut out frame, I ended up with a round scalloped card and no frame......best of intentions don't always work out the way you think they will. Nonetheless, I am very pleased with how this turned out and look forward to sending it out for Easter. I colored the flowers with my blue, green, and yellow Copics - then cut them out. None of the blue paper I had really rocked my boat so I found this lovely soft green patterned CS that appealed to me more. I'm pretty sure I will never grow tired of my Cheery Lynn Border Flourish die that I used, it is a favorite of mine. I was shopping last weekend and came across a little thing called "Action Wobbles" - they just fascinated me. They are little springs you can mount an image on so that when you touch it the image rocks back and forth. 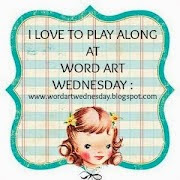 I thought of my good friend Pat, and wanted to share them with her......so I sat down and made a card for her using one and will mail it with some 'Action Wobbles' so she can play. While most of the info I viewed had people using these on the outside of cards I used mine on the inside. To do this I chose an Art Impression stamp. These "Girlfriends" are really rocking out shopping and you can see the results when you open the card. This is my first ever attempt at loading a video so you can see how this looks on the inside....I laugh every time I open this card, good thing its going in the mail today. I always surprise myself when I make a card that doesn't have a horse or scripture on it somewhere - LOL. It isn't as if I don't have a LOT of other stamps in my stash!! While looking through my drawers I came across this inexpensive ($1.00) Inkadinkado stamp from JoAnn's and thought it would be fun to play with. After coloring this sweet little creature with my Copics I wanted to create a unique effect......sooooo - I stamped the entire surface with Versamark and used some old embossing powder in my drawer 'Cow of Many Colors'. The effect was just about what I wanted, but I decided to once again cover the image with Versamark and embossing powder. This particular embossing powder has several different tones to it depending on how the light hits it, sort of like water. My little fishy looks just great in his special little pool of color! I am laughing at myself....a few weeks ago I posted my first Valentine and was sooooo proud that I had actually gotten some of my cards done in advance. The card for my DH sat on my counter, and in between stamping I was reorganizing my room. DH kept wandering in and I didn't want him to see his card so I put it away (fully believing I would remember EXACTLY where I put it - LOL) - went looking for it yesterday and don't you know I CAN NOT find it!!! Willing to bet tomorrow it will magically appear, but I needed a card TODAY, so I took some time this afternoon to make him another one.......actually like this one better!! Inside is a very nice mushy sentiment with wishes for a fabulous Valentines Day!! I titled this "Lost my Heart" - this has two meanings: one I lost the heart card I made - but it also means that I lost my heart to my DH 33 years ago when two became one and I am here to say 'life is good, I am blessed'. The challenge at Our Daily Bread Designs Blog was to case a card from a design of someone we follow or admire. WOW - how tough is that!!! Aside from the many blogs I follow, there are all the Design Team members at Our Daily Bread Designs whose work inspires me on a regular basis. For the first few days I was immobilized as I tried to think of what to do. To try and make it easier on myself, I thought I would first choose a stamp, then go through the gallery and make a decision. While choosing a stamp at least kept me more focused - there were too many beautiful cards to case. I literally just chose a number in my head and counted out in the gallery to a card....it was by Sandee Shanabrough. Seeing her name brought a smile to my face...you see last weekend I met Sandee at the Lawrenceville Stamp show - how fun to case a card she created. Sandee stamped her design and did no coloring, so that is what I did....I left off the ribbon and changed the size - as the challenge said change two things.....While this is monochromatic in design I really like how it turned out. I considered coloring the image (and in fact made one using my Copics) but stamped a second to use on this card. Catching up with my Valentines cards - this one is for my DD. I orginally chose this paper with black in it to use on my DS card but as I started working it evolved into this, and once I added the pearls (I so like pearls) it seemed to call out 'daughter' to me. Step cards are just plain fun to do. I used a few Spellbinders to create the frame for the sentiment and my Cricut to cut the hearts along the bottom. Inside is a sweet message for her, she appreciates any and all cards I make so I can't wait to share this with her on Valentines Day. Now I need to get busy on one for my DS. Challenges: Creative Belli Blog Challenge 136 Hearts/Valentines, Delightful Challenges - Love, Perfect Sentiments Challenge PSC18, Sentimental Sundays #88 Feel the Love. Sandee Shanabrough, me, and Kelley at the Our Daily Bread Designs Booth in Lawrenceville, Georgia. Sandee is a member of the Breadsticks Design Team. What a blast working the stamp show, and meeting in person people whose blogs I follow. I had the privilege of helping Our Daily Bread Designs when they were in Collinsville, Illinois last June and was so happy they were willing to have me back to help out after I moved to Georgia. Kelley and her husband Rick are the nicest people. Josh who works with them was there as well - a great young man. It warms my heart how organized they are setting up, working the booth and then tearing down....they have it all down to a science. I especially enjoy helping them pack it up to put in the truck because it makes you realize how hard they work and what road warriors they are. Visiting with the people who come to shop is great fun. Kelley has tons of cards, made by the Design Team displayed all over, and customers 'ooh and ahh' as they browse, shop and get inspired. Julie Warner - another Breadstick was there as well. Of course, I didn't just work the booth I got some shopping in as well and can't wait to start getting inky and play......look for me to post a few of my new creations this week.